Having to clean rusted cast iron grates is not the end of the world. Here’s how to get your cast iron ready to cook delicious food again in no time. Maybe you left your grill unseasoned, exposed to the elements for too long, or you bought a smoker at a yard sale for a steal, with its grates already rusty. Cast iron can rust, and it’s important to take good care of it so it’s safe for cooking food. There are a few different products designed specifically for combating rust, a few of which were used in the video above (namely, a wire grill brush, a heavy duty grill scrubber, and a stone grill cleaning block). There are also a number of different rust removal products and home solutions, ranging from “marinating” the grates in vinegar or soda, to using sanding paper (which we suggest you never, ever try). Do your research before going for any one of them. It’s safe to say that any good scraping product designed specifically for grills is a good option. Take your time and scrape away the rust, making large motions across or around the grates. This will ensure you get the rust off evenly, and not scrub down deeper in certain spots. Some products will take the shape of your grates as you use them, making it easier to get into all the nooks and crannies – otherwise try to get as much rust out as you can. After you’re done scraping the cast iron, it’s time for the most important part of maintaining food safe cast iron grates: seasoning. To do this, start by firing up the grill to a temperature of at least 400ºF. Once it is up to temp, apply a layer of good quality vegetable oil (make sure to protect your body from the heat while you do!). Coat as much of the grate as you can. When the oil has cooked through the cast iron, apply a second layer, and let that completely evaporate as well. Repeat 4-5 times, ideally on both sides of the grates. This process will protect the grates from rusting again. 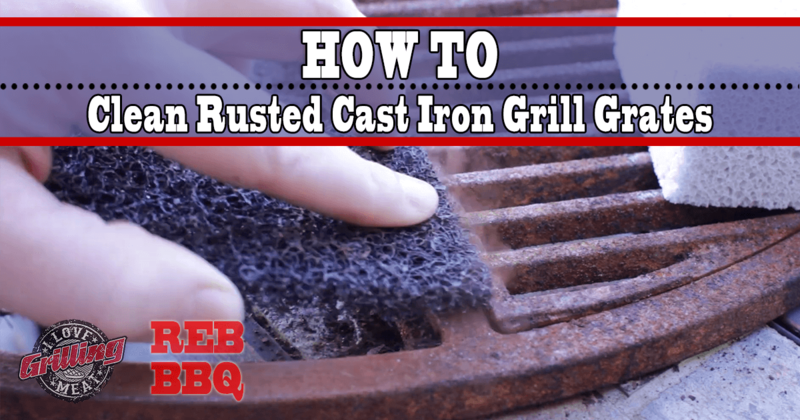 Cast iron grates are phenomenal – but they need some maintenance to keep the rust away. One way to take good care of your cast iron grates is laying down a coat of vegetable oil before every cook, and one afterwards. This way your cast iron will stay clean and shiny! This channel is dedicated to the family and the love of cooking in the great outdoors. At Smoked Reb BBQ I try to showcase basic BBQ techniques while incorporating my daughter in my videos and have her help me cook. Everyone can cook great BBQ, you just need patience and persistence! And most importantly, its not just about the BBQ, it is about family as well.